Unlike standard "matt finish" inkjet media, these Liquid Defense discs has a "high gloss" "white printable" surface, that creates stunning "Photo Quality" prints. The discs you will create with "Liquid Defense Plus" inkjet media will look fantastic, especially if you are using high resolution artwork and a hi-res printer. It is comparable to printing on photo paper as opposed to regular paper. The High-Gloss finish produces excellent contrast of printed colors which makes dark colors look deeper and bright colors more vibrant. Unlike the surface of normal inkjet printable CD's and DVD's, "Liquid Defense Plus" surfaces are completely water resistant, furthermore, there is no bleeding of the ink. 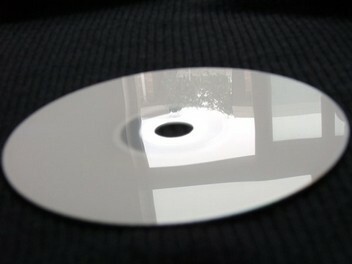 PlexDisc recordable 8.5GB Double Layer DVD media is made in Taiwan for superior quality and performance. They are perfect for recording movies, files, games, and more. 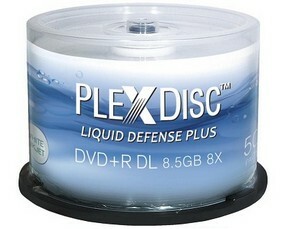 The PlexDisc recordable 8.5GB Double Layer DVD media is affordable and works in a wider array of duplication and recording devices compared to cheaper, less reliable media options. Liquid Defense Plus is a special water and scratch resistant inkjet printable coating applied to a whole range of recordable CD's, DVD's and Blu-ray discs. It works on all known optical disc inkjet printers and gives the printed disc a very vibrant color with a high gloss finish. 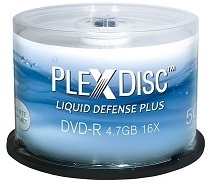 The Liquid Defense Plus disc is water resistant, scratch resistant and resists fading, whereas regular inkjet printable discs will bleed or smear when wet, easy to scratch and has a muted matte finish when printed. The Liquid Defense Plus application is an actual coating that is applied during the media manufacturing process. It is not a sticker or label that is applied after the fact, like other less reliable inkjet printable discs, which claim to be water resistant and glossy.